Studying abroad can be great for any sorority woman. It enriches your college experience in many ways, giving you amazing memories and something awesome to add to your resume. In most cases, students study abroad in their junior or senior year, so there’s plenty of time to prepare for a trip even if you’ve never thought about it before. Of course, the most important reason to study abroad is to see a different culture, meet new people, and learn how things are done somewhere else! 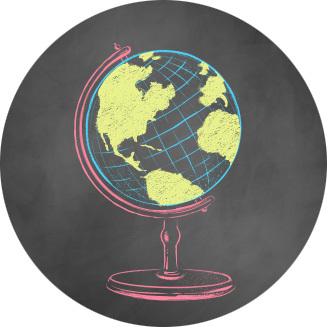 Even if you’ve never been outside the U.S. before, studying abroad will give you great perspective along with the structure to make sure things aren’t too overwhelming. As a student abroad, you’ll have plenty of contacts – other students, professors, and support staff – to make it easy for you to explore different ways of life. One reason why most people wait until later in college to study abroad is because it can offer a deep look into your major. When studying abroad, students are often affiliated with some of the best schools in the host country – and some of the “classes” are actually one-on-one instruction with a professor. That means you’ll have the chance to learn and absorb much more information than you would in a typical semester. What most people don’t realize about study abroad is that it can often lead to long-term study at the host school. If you’re thinking about the possibility of a master’s degree or Ph.D., it makes sense to build up your network and have plenty of options. By studying abroad, you’ve already proven you can handle the workload and way of doing things in a particular country. That could be just the ticket if you see yourself as a future globe-trotter. Studying abroad won’t make or break your career, but it can get you off to a good start. First and foremost, it shows you were willing to go through the intensive preparation to be selected as a study abroad student, which is usually very competitive. On top of that, it proves that you can adapt to a whole new way of doing things and be successful. Those are all important soft skills that can make a huge difference in your early career. As a sorority woman, you have plenty of resources to draw on if studying abroad is your goal. Many of your sisters have probably been abroad and the sorority itself might even have special trips. Explore your options – and you could explore the world!